Copper Gotham™ Steel Baking Tray | The New Non-Stick Baking Tray Made with Titanium & Ceramic! Copper Gotham™ Steel Baking Tray is great for all this and more! The Ti-Cerama™ surface combines super-strong titanium with super slick ceramic, so no more burnt on messes! Broiled cheese slides right off this pan. This pan is so strong you can jump on it. Even use metal utensils like a pizza cutter. Everything slides right out and not even a single scratch. Large enough to fit 36 jumbo meatballs, or bake chicken tenders and fries. Just give the pan a tip, and watch them slip. Even sheet cake flips out with ease for a delicious dessert with no mess to clean. Other pans warp and buckle under high heat. Not in this pan. With its industrial thickness and weight you can broil steaks and veggies on even the highest heat. Dishwasher safe, so cleanup is always a breeze. 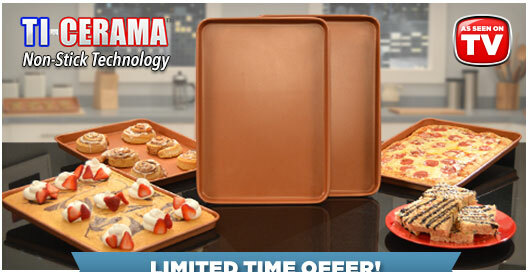 Just pay a separate $6.95 fee for the 2nd BONUS Copper Gotham™ Steel Baking Tray! Order your Gotham ™ Steel Baking Sheet today for just $19.99 + $6.95 processing & handling and we'll DOUBLE the offer and send you a 2nd BONUS Gotham™ Steel Baking Sheet, just pay a separate $6.95 fee!